A light bright week in the garden which has drained like an old sponge, dry on the surface but slimy underneath. A drop of rain on wednesday night put things back to normal, paths covered in squelchy footprints. The end of the week saw a return to wintery sunshine and sparkle. The good news of the week started on friday when I came home to find a big pile of wood chippings in the drive. I love wood chippings, and some kindly contractor had left a couple of trailer loads for me (there is an open invitation when they have chippings to get rid of). Happiness, but it gets better. Last winter a Sycamore fell down over my neighbour's power line and Western Power Distribution marked a couple of others for removal that were causing problems. On friday they took them down and left a tidy pile of cut logs. I was overjoyed. Not that I care so much about my neighbour's power supply (sympathy, but they will survive), the falling tree missed my greenhouse by inches and I was worried about the next one. Yesterday I was able to spend a whole day cutting down the Eucalyptus grove that had tumbled like a row of dominoes towards the house, just held by the last E. gunnii which would have wiped out the house if it fell. I have intervened and it is all safely down. So if I am being honest, the four things that have made me happiest this week are all piles of firewood. This Camellia is a little unseasonal but trying hard to outshine a pile of logs. 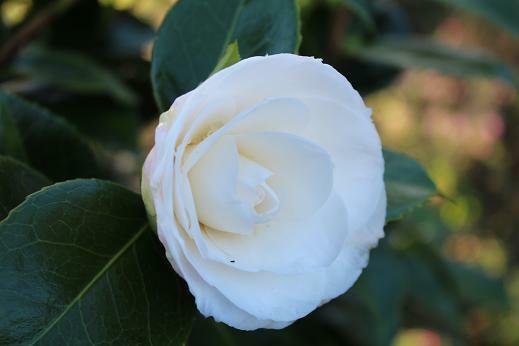 Raised by Nuccio's Nursery in California and introduced in 1978. Twenty five years later I bought this one for a few pennies from a discount hardware store. Like a leaning Eucalyptus, the mighty have fallen. At the top of the garden, the Agave house briefly became to location of choice for every strange scrap of foliage that came my way. Calceolaria pavonii is up there, which puts its arrival here somewhere between June 2013 (when I started planting) and June 2014 (absolutely no space left). Fortunately it was planted early in the process when things were still being given a reasonable space to grow. It didn't flower last year but produced plenty of vigorous and spindly growth. This year it has managed a few pale flowers and is a weak imitation of a friends, burgeoning outside. Next year I will root some cuttings and it will go out into the sun. There is a lot more of that getting into the garden now. I planted it in the Agave house because I doubted its hardiness. It seems to be quite tough but it was introduced to the UK around 1850 so why isn't it grown everywhere? I suspect the answer is that it isn't as reliable as a mild winter might suggest. In 1850 it was described in Curtis Botanical Magazine from a plant supplied by Messrs. Lucombe, Pince and co. nurseries of Exeter. The text says "requires the protection of a pit or greenhouse during the winter" and I think that may still be true. Last winter I repotted all of the Clivia. It was too late to influence flowering this year but I have had a summer of improving foliage and a return to vigorous growth. 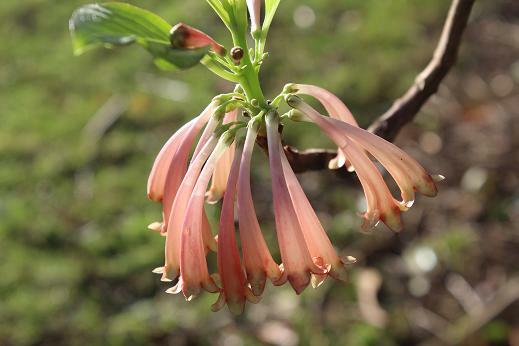 I am hoping for a spectacular display from the Clivia miniata forms next spring. The first clear sign of improvement has come from some seedlings of Clivia robusta, an autumn flowering species. I have a few flower spikes coming up and although they don't make a spectacle, they don't make it with great charm. Clivia robusta has only recently been described, previously the large plants growing in swamps and wet places had been included in C. gardenii and there is still some animated discussion about the dividing line and the nature of the distinction. Plants found in the wild in the Transkei region of South Africa are variable. The Maxima Group derive from a population of very large plants found by Fred van Niekerk in the Umtentu River Gorge. These are grown from seed collected from cultivated plants, the original population is believed to have been destroyed by local collectors of herbal medicines (it is used as a remedy for snake bites among other things). Sunny days and low night temperatures remind me to get the fleece ready - the plants will have to be covered up soon. It is very easy to put it off until tomorrow (and tomorrow and tommorrow) until suddenly it is one tomorrow too far. 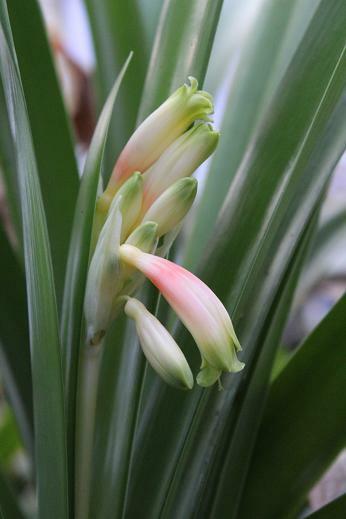 Clivia take a long time to recover if the leaves get damaged. Winter can be a trying time. All through the summer I seem to acquire plants that play with the idea of hardiness like a cat playing with a mouse. When I am feeling all puffed up and sensible I look at them in the autumn and boldly declare that those that can survive here are worth growing and those that die are just not hardy enough to waste time on. Wouldn't it be marvellous if things were that simple. Through all the bluster a few things are clearly special cases. I was quite convinced that I had cut it down to half a dozen plants that had to come onto windowsills and the like for winter. Things that I am simply not prepared to lose. I brought the six plants in, and then followed it up with another ten trays of the tender, folorn and indispensable. Among the last minute rescues was Dermatobotrys saundersii, an epiphytic shrublet from coastal forests in South Africa and Madagascar. 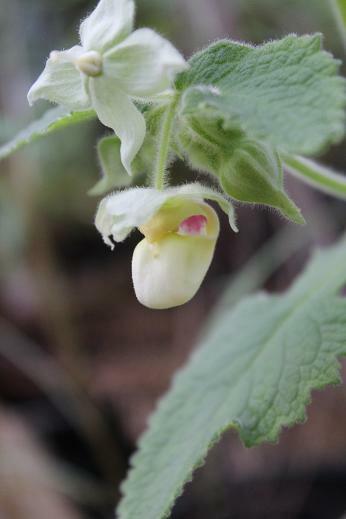 It is now very rare in the wild but has been secure in cultivation since the 1890's when seeds were sent to Kew. It will tolerate a degree or two of frost. American sources suggest it will survive down to -7degC but it was killed here in the greenhouse when temperatures dropped to -5degC. Fortunately I had a second seedling indoors and I know that as soon as it starts to flower it is time to bring it in again. A bright suny morning was the cue to take it outside to have its picture taken before it came back into the relative warmth. It's a plant that I am just not ready to lose yet and it sparkled in the sun. It is a little sad that after waiting a year for the flowers I was in a hurry to get it inside again so that I could get back to my log pile.